Nice return for our Tune of the Day and it’s just the way we like it, soulful on a Monday. DJ Roland Clark’s Urban Soul project has worked with the King Street label many times over the years, one of its main ambassadors as it championed the original soulful house sounds of the US, long before the commercial urban crossover sound that seems to be so popular just now. 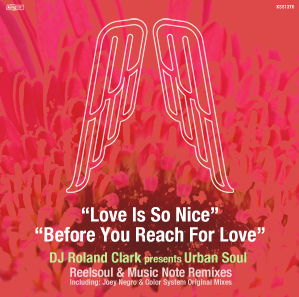 Here, two of his tracks get the remix treatment and first up is ‘Love Is So Nice’, which is handed to LA’s Will Rodriguez aka Reelsoul. Reelsoul supplies a vocal and a dub, and with a voice as lovely as Troyetta Knox’s, it’s the vocal that does it for us. The track is just beautiful soulful house, complete warm up / beach bar material, the kind of track you should love hearing as you chill out by a pool – ideal summer sounds. Japanese producer Music Note remixes ‘Before You Reach For Love’, again coming as a vocal and a dub version. As before, it’s the vocal for us as Music Note creates a solid slice of 4/4 house music, ideal for the cooler dance floors or those looking for a change from all things bleepy. Two good remixes here, out next month on Traxsource with a full release in October.